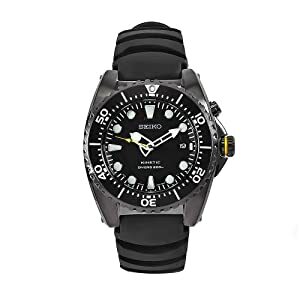 This watch looks similar to other Seiko dive watches, although a couple of small splashes of yellow make it particularly cool. The case and bezel are stainless steel with a matte black finish that exudes style. The watch is somewhat big and heavy, so it might look awkward on smaller-armed guys. The black rubber watch band is functional, tough and comfortable. Standard fare for dive watches, it has a bezel that rotates in only one direction and it is water resistant to 200 meters (660 feet). The face is easily readable, with large hands and hour markers. Overall a rugged and handsome watch that is great for everyday use.